LIVE High School will equip you to speak into students’ lives amid all the other voices and help them discover the value of placing Jesus at the center of everything. This curriculum is ideal for teenagers’ formative high school years, when intense pressures require a Jesus-centered perspective. LIVE High School, rewritten in July 2014, intentionally helps students discover the value of placing Jesus at the center of everything. 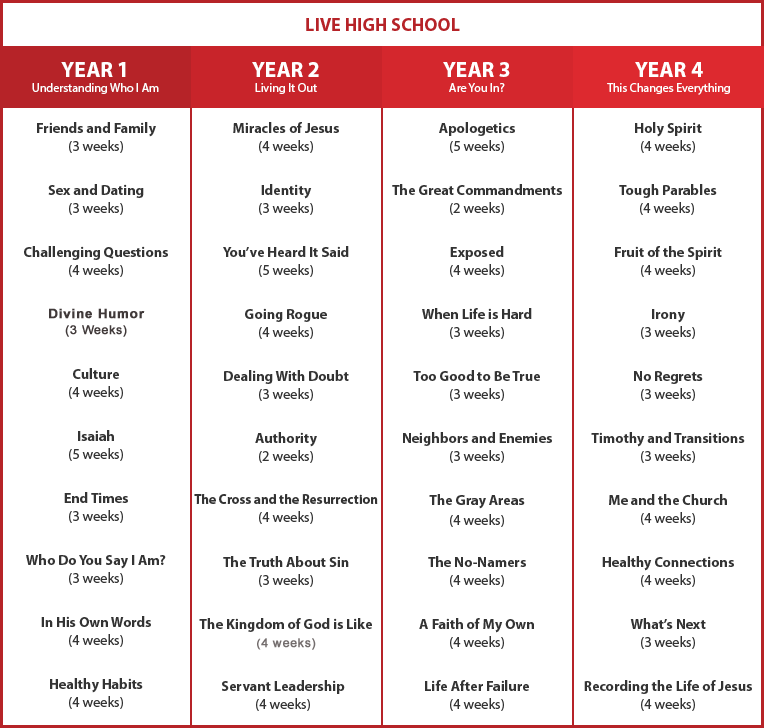 We’ve created an entire slate of new lessons and restructured the format with a “beelined to Jesus” focus. The curriculum is written for each distinct year of high school: freshman, sophomore, junior, and senior. Year 1, “Understanding Who I Am”: Students will discover how Scripture directly helps them understand who they are in Christ. Year 2, “Living It Out”: Students will be challenged to apply these truths to their day-to-day lives. Year 3, “Are You In?”: Students will be equipped to know why they believe what they believe and to defend their faith. Year 4, “This Changes Everything”: Students will connect the dots and see how Jesus radically changes their lives today and forever. All 144 lessons feature topics, illustrations, activities, and questions that will engage and involve your students. Open-ended questions create room for authentic discussions so you can find out what’s really going on in young people’s lives. Save Time: Save hours of planning time by following our cohesive 4-year plan, based on a 36-week ministry calendar. Maximize Impact: Intentionally help high school students encounter Jesus through creative, thought-provoking conversations. Re-written with fresh content and a new lesson plan, LIVE High School helps students grow and draw closer to Jesus through four of the most formative years of their lives. Friends, parents, teachers, coaches, and culture all influence your students’ decisions, including what to focus on and where to invest their time. Because the pressures on young people today are more intense than ever, a Jesus-centered perspective is essential. LIVE High School will equip you to speak into students’ lives amid all the other voices and help them discover the value of placing Jesus at the center of everything. This curriculum is a cohesive, 4-year plan (based on a 36-week ministry calendar) written for each distinct year of high school: freshman, sophomore, junior, and senior. Year one helps students understand who they are in Christ. They discover how to live out their identity in year two. Next, challenge students to go “all in” with Jesus in year three. Finally, year four emphasizes how the good news of Jesus changes everything and impacts their lives forever. All 144 lessons feature topics, illustrations, activities, and questions that will engage and involve your students more effectively than generic, lecture-oriented curriculum. With a price tag of $499 you will receive all 4 years of material (that’s less than $3.50 per week) that can be used in any ministry format and is being taught to age groups ranging from middle school to post high school/college. By making simple adjustments based off your ministry’s DNA you can adapt the LIVE curriculum to any or all of these age groups. But wait! There’s more! You’ll know what your small groups will be discussing six months from now, so parents will gain more confidence in your ministry, and along the way, you’ll provide them with resources to spark conversation and dialogue in the home. I can’t think of a better tool to help families grow closer together and closer to God in the process. 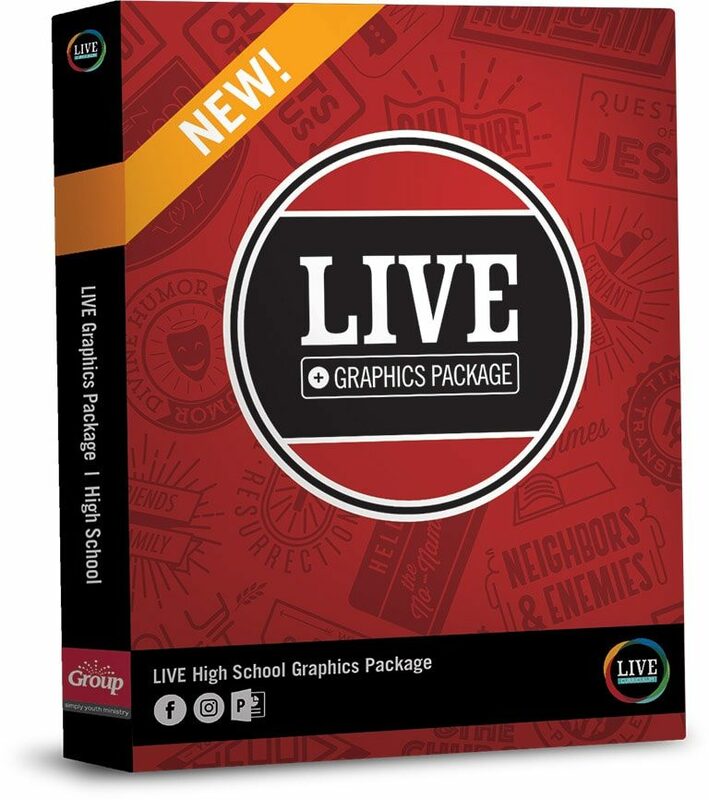 And this NEW version of LIVE High School is designed with greater intentionality than ever before. We’ve created an entire slate of new lessons and restructured the format with a “beelined to Jesus” focus. So even when you’re studying a passage from the Old Testament or discussing a real-life issue for today’s teenagers, you can find the road back to Jesus. Tackle timely topics and biblical truths through engaging conversations. Help students discover how Scripture directly relates to what they’re dealing with right now. Challenge your teenagers to think critically and figure out why they believe what they believe. Open-ended questions create room for authentic discussions that lead to those hard-to-reach places—you know, the conversations where you find out what’s really going on in their lives. LIVE High School is the kind of investment in teenagers’ lives that will produce more rewards and benefits than you can count!. We’ve developed LIVE lessons as a cohesive, four-year plan for your youth ministry, using a 36-week ministry calendar year. The lessons are designed to flow from one topic to the next, and each year builds on the previous years. But since we know every ministry is different we give you the option of taking it apart, shifting around the pieces, and using the lessons in whatever order you’d like. You can prayerfully schedule the lessons as you sense God’s direction in your ministry. It’s all good! 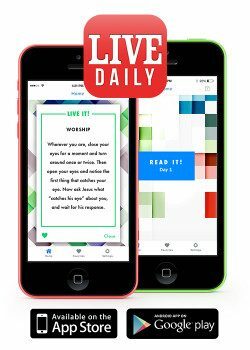 LIVE High School includes access to the innovative new LIVE Daily app that sends “in the moment” prompts and ideas for living out their faith. Each day’s idea taps into different ways that people learn—through serving others, reading Scripture, tackling questions, looking toward Jesus, and worshipping in ways beyond singing songs. "A 4 year cycle ensures a thought out, strategic plan for teaching." "This product rocks. It is easy to use, very high quality content and the students resonate with it well. It is easy to tweak or use as is. Leader prep is good too"
"Quality programming in an easy to use format."